Are you looking for a long-term flooring investment? Look no further than our hardwood flooring store. Here you will find a beautiful collection of wood floors that complement your décor, whether it is traditional, modern, or eclectic. Stop by and discover the difference at our reputable local flooring store. We provide our valued customers with selection, sales, and professional hardwood flooring installation--everything you need to add to the appeal and value of your home or business. It is our mission to make shopping for flooring enjoyable and productive. Let us help you find the floors that match your design preferences and meet your lifestyle requirements. In addition to our diverse selection of species, we sell flooring planks in three distinct types – engineered hardwood, solid hardwood, and handscraped hardwood. Our knowledgeable sales representatives are ready and waiting to help you pick out the flooring type and style that best suits your home. These professionals have training in all of the flooring types and brands that we carry, as well as design. They are only too happy to help you find exactly what you need to perfect that space. On top of that, our experienced flooring specialists are available to provide timely hardwood flooring installation services. From start to finish, we are your dependable flooring source. No matter which hardwood flooring you choose, you are getting an outstanding material that future generations of your family will enjoy. Hardwood is easy to maintain. Its smooth surface allows you to clean up spills with ease. The only equipment you need to keep your hardwood in prime condition is a damp cloth and your preferred wood polish. Hardwood floors continue to impress no matter how long they have been placed in any room or area. Plan to be impressed by the stately appearance of your home when you install a hardwood floor. On top of that, hardwood is a major selling point for home buyers. It dramatically increases your home’s value. When you ultimately decide to sell your home, you can top the listings in confidence, thanks to the attractive power of hardwood. Our flooring experts are here to help you find the hardwood floors that make sense for you. Whether you choose solid or engineered hardwood flooring, you improve the sophistication of your residential space. Below are some key differences between the two types of wood flooring. Solid hardwood flooring evokes a beauty like no other floor covering. 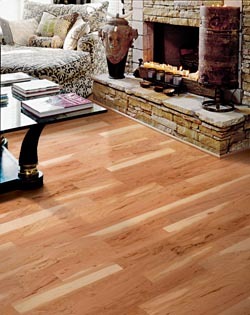 With its inherent grain designs and rugged or smooth textures, solid hardwood adds an unrivaled aesthetic to your home. When you invest in this type of flooring, you instantly add value to your property. You’ll give your home a lasting visual appeal with this choice. This classic flooring option gives your interior a timeless ambience. From the distinctive coloring and grain patterns, to the telltale sound of your footsteps, it provides an unmistakable air of elegance to your home. We sell wood planks in a variety of types and finishes. Solid hardwood is the flooring you see in those classic old homes. It is flooring that is milled from a single board of hardwood species, so it is a solid piece of wood throughout the strip or plank. Because of this, you can sand and refinish your these floors when they get scratched or worn. In fact, with proper care and maintenance, you can expect them to last for as long as 100 years. Looking for strong, long-lasting floors? Look no further than engineered hardwood flooring. Engineered hardwood is specially designed to stand the test of time. Due to its multilayered construction, this hardwood type easily resists everyday wear and tear, cracking, and warping. Old World aesthetics and contemporary sensibilities unite to create a flooring option that complements nearly any type of home. These wood floors are constructed in multiple layers to offer a beautiful aesthetic and the functionality you seek. On the surface of each of its planks is a veneer of the hardwood species of your choice. Underneath that are strong and moisture-resistant layers that are bonded together. As you can imagine, this produces flooring that is tough and durable. This flooring is designed to withstand humidity and harsh climates. With this in mind, you can install these floors in any room of the house as this option does not react to water. Create a rustic ambience within your home with our handscraped hardwood floors. Applying the craftsmanship of a master artisan, handscraping involves carving unique textures into each plank. These days, this can be done by hand or machine. Although a beautiful aesthetic today, back in the day, this was the way the craftsmen would smooth out the surface of individual planks. No matter how or why it is done, the end result is a visually stunning aesthetic effect that your guests can see and feel. Our store sells a diverse array of flooring options that suit your specific tastes. Now that you have purchased your hardwood floors, trust our certified contractors to provide professional hardwood flooring installation in your home. Our contractors employ years of experience and high-grade tools to ensure that your flooring is properly installed from corner to corner. We deliver the complete flooring package. The best way to make sure your wood floors always look lovely is to make use of our professional installation service. We send a team of skilled technicians to your home who know the best practices for installing your new floors. Hardwood is not easy to install as you must take into consideration breathing room between boards and at the edge of the flooring. Another consideration is placing the individual planks for a complementary appearance. Install your newest investment with total peace of mind with our Ultimate Confidence Guarantee™. Our goal is to ensure that every service we conduct is performed to your complete satisfaction. Our company pledges unparalleled service, fail-proof installation, and unbeatable prices for each of our customers. Speak with a representative for complete details and product eligibility. Transform your home with the hardwood flooring you have always wanted. Contact our store to learn more about our products and services. We proudly serve clients throughout Jackson, Jackson Hole, and Wilson, Wyoming.